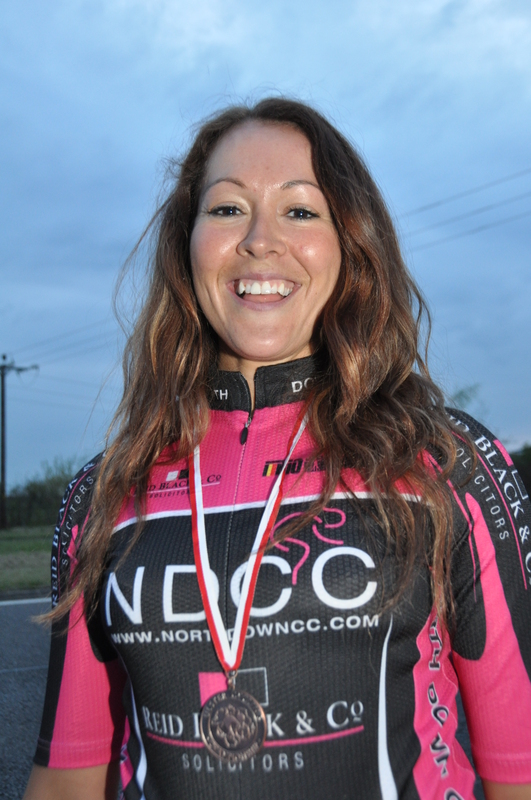 The Ulster Team Time Trial Championships has continued to grow in popularity in recent years and tonight was no exception. The event, promoted by Phoenix CC, saw a total of twenty five teams sign on. Hot favourites were Curran Racing consisting of Liam Curran, John Madden, Ian Inglis and David Hamilton. They did not disappoint clocking up a fantastic 50.18 for the twenty five mile distance to take the Gold medal in the men's competition. Phoenix CC managed to enter a total of ten men's teams so it was no surprise that they would have a team on the podium. It was well known tester, Stuart Bennett, who led his team of Marcel Kock, Paul Hesketh and John Smyth, home to take silver in a time of 52.11. Madigan's team of Simon Stockton, Stephen Harkens, Stuart Scott and Nigel Laffin were the bronze medallists on the night. A young composite team of Juniors, Conor Young (Ballymena), Craig Crawford (Duffin Transport), Craig McAuley (VO2 Development Team) and Conor McAteer (Bann Valley) were third overall on the night with a time of 52.27 but as a composite team were not eligible to win the medals. The biggest surprise of the night was the excellent turnout of women with a total of five reams lining up. 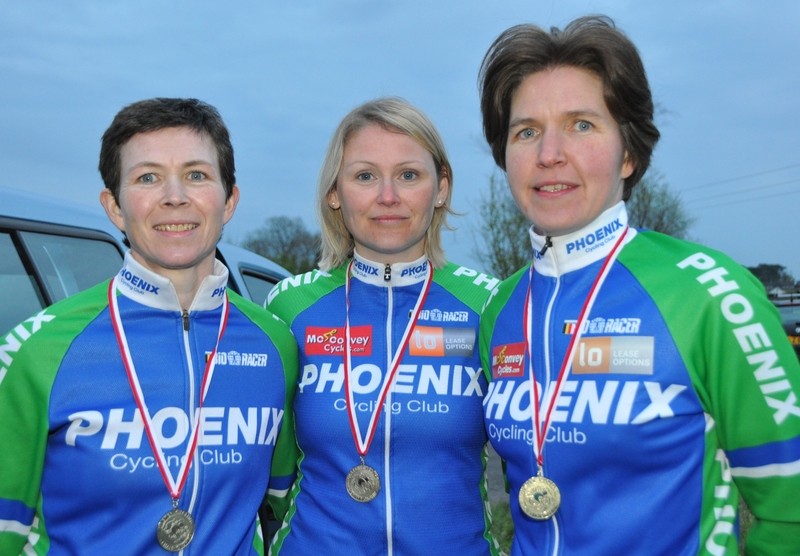 Phoenix fielded two women's teams as did North Down with Ballymena making up the fifth. 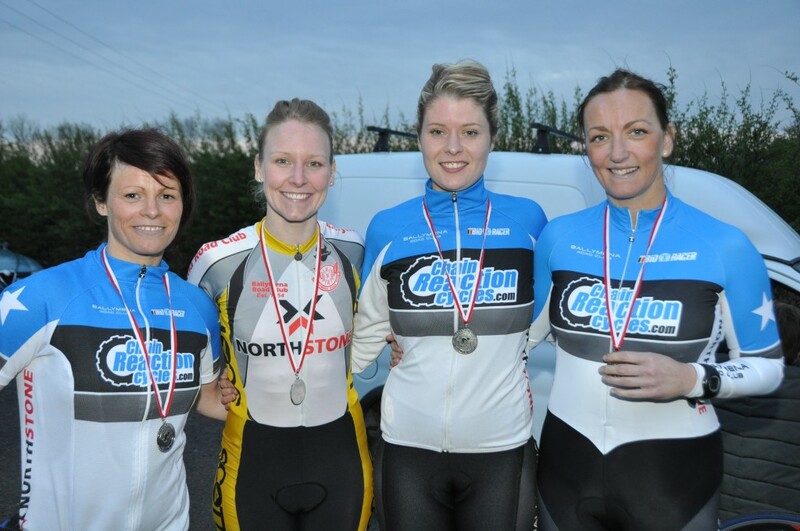 In the end it was the Phoenix squad of Therese Zwahlen, Karen Hull, Julie Rea and Judith Russell who proved fastest on the night with an excellent time of 1:03:11 beating Ballymena's Louise Fullerton, Claire Gillespie, Emma Smyth and Eileen Burns by just over a minute. The North Down quad of Janine McNally, Louise Togneri, Ange Perott and Angela McMullan took the bronze medal with a time of 1:06:12. 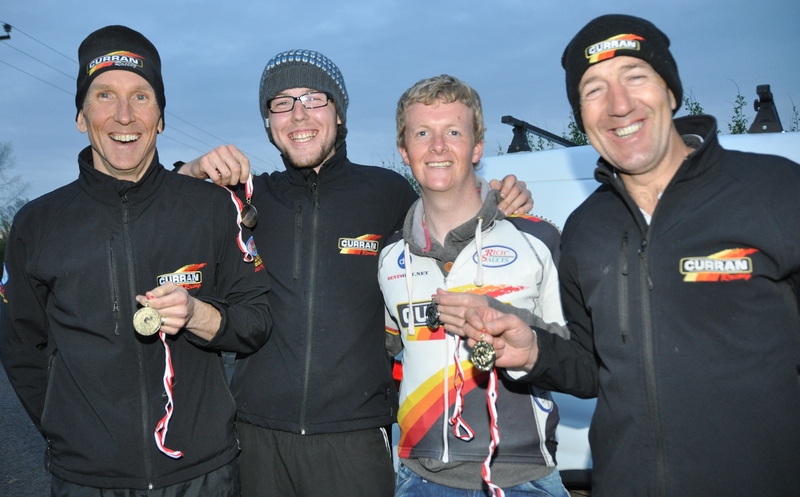 Missing from action tonight were the usual squad from East Antrim Audi but perhaps Gary Cranston and crew were too tired after their tough racing in the Tour of Ulster. It was great to see the North Down women out in force and perhaps next year the North Down Men might be up for the challenge. While Ross Blayney showed off his aerobatics in Rostrevor on Sunday and Matty's Brae defeated Matty Blayney on Monday it was left to the North Down women to do the business tonight!! Thanks to all the marshals and helpers on the night and a special word or thanks to the commissaire for the evening, Brendan Kirk, and timekeeper Gordon Parker. I also have a time of 57:23 for a Phoenix pair who did a two up although I don’t have any names.